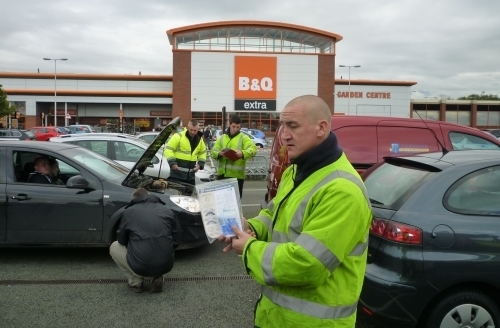 To enhance the road safety message of ‘being prepared for winter’, Cheshire Fire and Rescue Service took to the road across their region with a series of events in supermarket car parks and other key venues. With the onset of winter and a change in driving conditions, it was timely to deliver a safer winter driving message to shoppers and other car owners. What did the Cheshire Fire and Rescue Service do? Facilitated by TyreSafe, the Service partnered local company ‘Tyres on the Drive.com’ and local Borough Council road safety officers to assist its operational fire crews, along with Community Safety Advocates, at 14 tyre safety roadshows where more than 1,000 motorists learnt about the importance of looking after their tyres. At the events, there was the offer of a vehicle check, with the tyres being inspected by a representative from ‘Tyres on the Drive.com’ who offered advice on tyre condition and the importance of maintaining the correct tyre pressure and tread depth. Meanwhile, motorists were also given a specially designed winter driving leaflet and advice on a 1:1 basis. A total of 282 vehicles were checked during the month long campaign, with a further 840 motorists receiving advice and information. Feedback shows that the public found it to be useful, informative, beneficial and timely. Meanwhile, the fire crews responded positively in engaging with the public, using their individual experiences relating to tyres and road traffic collisions.